Opportunity to post resume on ABWA’s Career Connection Board. Discounted registration fees for ABWA’s Nationally Sponsored Events. Subscription to ABWA’s award-winning magazine, Women In Business. Discounts on business products and services including $1,500 in Accidental Death and Dismemberment insurance in states eligible to participate. Q. Would you like to read more about ABWA Membership? A. Click here to download the brochure. Q. How much is ABWA Membership? A. National Membership is $115 and North Dallas Business Womens Network is $50. Total Cost $165 (must be a member of National ABWA to join local). Q. Must I own a business to join? A. 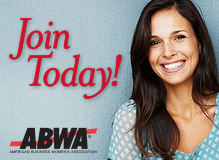 No, ABWA membership is available to anyone (businesswomen, entrepreneurs, stay-at-home moms, retires to include men). Q. May I join at anytime during the year? A. Yes, you may join ABWA at anytime throughout the year.